Private labeling is one of the most effective ways to make your products stand out from the millions of others listed for sale online. Creating a private label product can give you more control over production, pricing, branding, and profitability. It has become a very popular business model for sellers on online marketplaces such as eBay, Amazon, and Etsy. And the good news is that it’s not hard to get started. However, there are common pitfalls that you need to be aware of before committing to your first private label product. This guide will take you through the benefits and risks of private labeling, including tips for how to source the best private label products. A private label product is one that is manufactured and supplied by one company and offered for sale under another company’s (or individual seller’s) brand. For example, say you have been selling wholesale Wayfarer-style sunglasses on eBay, sourced from a supplier in China. They are generic sunglasses that don’t have any branding and dozens, if not hundreds, of sellers are selling the exact same product at similar prices with low profit margins. In this example, private labeling would involve you creating your own brand and arranging with your supplier to print or emboss that brand onto the same, or similar, Wayfarer-style sunglasses. You might also ask if they can manufacture customized casing that also features your brand name and logo. That way you have your own, exclusive brand of Wayfarer-style sunglasses ready to sell online. Private labeling has become a popular way for online sellers to add value to their product offerings and differentiate themselves from the masses of generic products being sold online. Traditional retailers, such as Target and Whole Foods, are also investing heavily in private label products. But you don’t have to compete with big-name brands to have success selling private label products online. There are many benefits and risks associated with private labeling that sellers should be aware of before getting started. Private label products will generally have higher profit margins than their generic counterparts. While it will cost more to get a manufacturer to add your branding to a product, you will be able to sell the product at a higher price. There is inherent value in a branded product even if the brand is unknown. Private label products will generally have higher profit margins than established national brands as the items are usually cheaper to make. 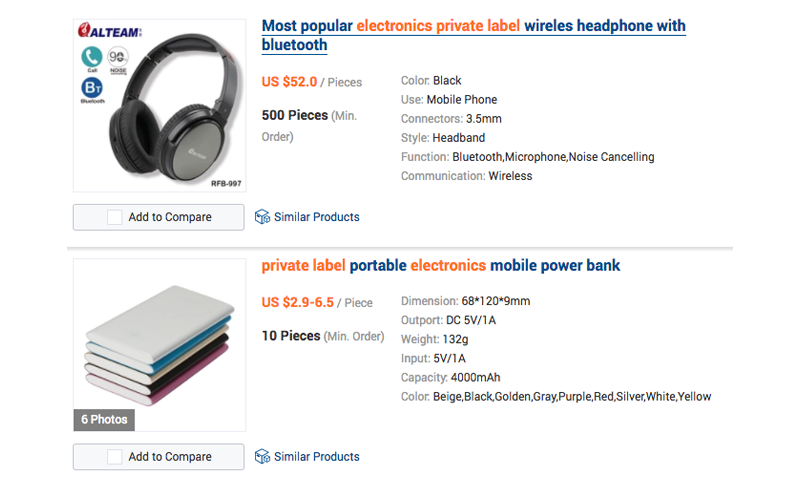 A major advantage of private label products is that they stand out from generic resale product on websites like eBay and Amazon. You are essentially setting yourself apart from your competitors and, hopefully, giving buyers more reasons to choose your product. It also removes the temptation of competitive pricing as your product is different to everything else out there. Creating a private label means that you have your own brand. It’s something you own and an asset you can build upon. Having a brand gives your online business an identity. If your buyers like your product they will purposefully seek out your brand in future, rather than opting for whatever generic product is cheapest. A brand could lead to starting a personal eCommerce store where customers can discover your full range of products. Ultimately, branding is about recognition, trust, and customer loyalty, all things that are more difficult to foster when selling generic resale goods. Having a private label product can help take your marketing to new heights. You are limited with what you can do to market a generic product. With your own brand, you have many more options. You can create a story around your brand, take creative product photos, build a social media presence, and target your product at specific demographics. Having a more purposeful marketing strategy can increase brand equity, customer loyalty, and sales. Product quality is a risk that all online sellers take. However, there is possibly more at stake for private label sellers. You’re taking the risk of putting your brand on a product that may not be up to scratch. And if a poor quality product makes it into the hands of your customers, your business and brand are going to suffer. This is why it’s so important to find trusted private label manufacturers and test sample products before committing to your first big order. You’re also taking a risk on the reliability of your manufacturer and supplier. What happens if they take too long, muck you around, or suddenly go out of business, especially when you’ve worked with them to create your private label product? Finding a reliable manufacturer helps to mitigate this risk, but you can’t eliminate it entirely. As a private label seller, you are likely to be liable for the product you’re selling. This can be a risk, especially with goods like baby products, or anything that is inherently fragile or dangerous (think electronics, safety equipment, sports and outdoor gear, food and dietary supplements etc). This can be particularly risky in the United States where civil lawsuits are common. Private label retailers can seek to shift liability to the manufacturer, but this is something that needs to be established before you start selling. There is also the option of liability insurance for your business. Selling a private label product with your brand on it leaves you open to potential legal issues. You need to be aware of trading regulations, possible trademark/patent risks, as well as the safety risks mentioned above. You also need to be wary of any words you use or claims you make on your packaging to prevent potential legal challenges. And if you’re going into competition with a big-name brand and they see you as a genuine threat, you can expect them to take legal action to either slow you down, or shut you down. Finding trusted, reliable private label manufacturers is essential to the success of your online business. But what does a good private label manufacturer look like? You want to find a manufacturer that specializes in producing your type of product. Just because you’ve worked with a manufacturer on a kitchenware product doesn’t mean you should stick with them for your private label Wayfarer sunglasses. Seek out manufacturers that have a track record in your niche. Securing a great price from the manufacturer means your profit margins will be higher. You will want to shop around. We recommend requesting quotes from five different manufacturers so you know you’re getting a competitive price. The difference with private labeling compared to dropshipping is that you’re negotiating the price for adding your branding and any other features to the manufacturer’s product. Make sure to also enquire about pricing for sample products, minimum quantities, discounts for bulk buying, and shipping costs. Product quality is probably the most important thing to look for in private label manufacturers. The best way to do this is by doing your research on forums and ecommerce websites. You can also use SaleHoo’s supplier directory, or any other trusted list of suppliers and manufacturers. It’s also advisable to get samples of your private label product made so that you can test them before they go to market. Some sellers even visit the factory to oversee the production process before committing to a manufacturer. Before committing to a manufacturer, ask them about delivery times. Any delays in getting your private label product to your store will result in lost sales and unhappy customers. What’s the manufacturer’s track record with product defects? This can be hard to come by, but you should be able to find feedback online from other sellers who have used the manufacturer. 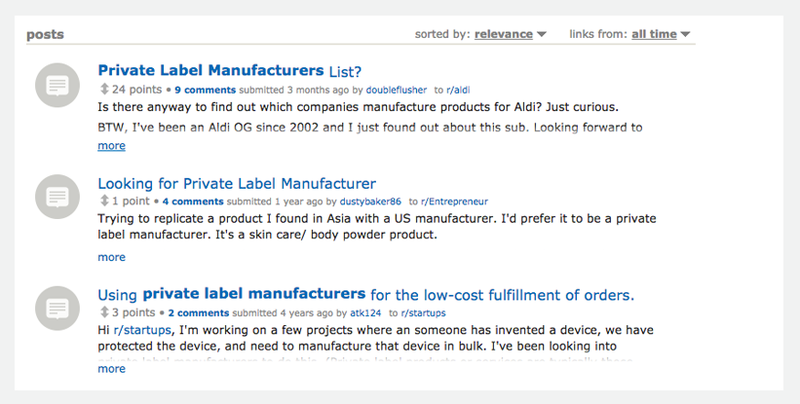 Reddit is a good place to search for private label manufacturers. Users will often ask for manufacturer recommendations. Warrior Forum is an internet marketing community and marketplace where you will find a lot of advice about private labeling manufacturers — some if it for free in the forums and some of it as paid information products. In the SaleHoo forum, members share their experiences with sourcing manufacturers and launching private label products. You will find lists of private label manufacturers, as well as discussions about private label manufacturers for specific niches. A great way to find private label manufacturers is by searching online marketplaces. You can search for private label products in your chosen niche and then proceed to contact the supplier to see if they’re able to manufacture your product. SaleHoo has a directory of over 8000 legitimate, low-cost suppliers, many which do private labeling. You can also find private label manufacturers locally by visiting trade shows and making contacts in your area. When it comes to private label products you’re really only limited by your imagination. You can learn more about how top sellers find hot products to sell online here. Otherwise, we’ve provided a few examples to help you get started on your private label journey. Enter ‘private label clothing’ in Google and you’ll find thousands of potential clothing suppliers and manufacturers. There are also a lot of options on Alibaba, Amazon, and eBay. Clothing is a popular private label option as it’s relatively simple, there are few moving parts, and very little can go wrong. There are also many markets to branch into, such as children’s, men’s, women’s and plus-size clothing. As long as you ensure the quality of the product before placing an order, it can be a good way to kickstart a fashion brand. Jiangxi Mass Garment Co. Ltd was found simply by searching ‘private label clothing’ on Alibaba. This China-based manufacturer produces a wide range of clothing especially for private labeling. Note: This is not an endorsement. SaleHoo cannot verify the quality or reliability of this manufacturer, it’s simply an example of how to find private label manufacturers. Private label perfume allows you to create your own scent and choose the bottle and packaging. It affords sellers a lot of creative control over the end product, which is one of the reasons why it’s a popular private label product. Unique Fragrance is ranked #1 on Google for ‘private label perfume’. It’s a United Kingdom-based perfume manufacturer that specializes in private label products. Note: This is not an endorsement. SaleHoo cannot verify the quality or reliability of this manufacturer, it’s simply an example of how to find private label manufacturers. Like clothing, swimwear is also a popular private label product. It’s a great way to launch a boutique brand. It lends itself to effective marketing campaigns which could be targeted at different parts of the world, depending on the season. BestClothingManufacturer.com was found in SaleHoo’s directory by searching for ‘swimwear’. The Pakistan-based clothing and swimwear manufacturer has been in business 11 years and offers private labeling. With the rise of wellness practices like meditation and yoga, private label yoga mats, blocks, and leggings could be something to look into. The popular buckwheat meditation cushions may also be available for private labeling from manufacturers. Electronics might be considered a high-risk item given all of the things that could go wrong, but items such as headphones, power banks, and accessories like smartphone cases are all options to consider. Entering into the kitchenware niche provides plenty of options for private label products. You might start with bamboo chopping boards before branching into utensil and knife sets, aprons and oven mitts. The options are endless. As you can see, there’s a lot to consider before getting started with private labeling. But if you put in the research and planning, it can be a rewarding way to establish a brand and grow your ecommerce business. Private labeling is really exploding! I used to be a smaller market, but now so many have the option of pushing a brand not backed by big stores I think it is so exciting! I myself am working with medidermlab and am working to have my own natural skin care products line. It's so exciting and a little scary! I appreciate your post it was very informative. Hi Millie! Glad you found this post informative and helpful. Private labeling is indeed advantageous as it will highlight your brand and what you and your company represents. Along with SaleHoo, we wish you all the best as you take stride in the exciting times ahead of you.